Chicago general contractor Summit Design + Build LLC has completed the renovation and rebrand of the former Hotel Indigo Chicago Downtown. The renovation updated the nearly century-old hotel with contemporary design throughout the 165 guestrooms, lobby, spa, restaurant and amenity areas. The 13-story hotel had been known as Hotel Indigo since 2005, when it was purchased by InterContinental Hotels. 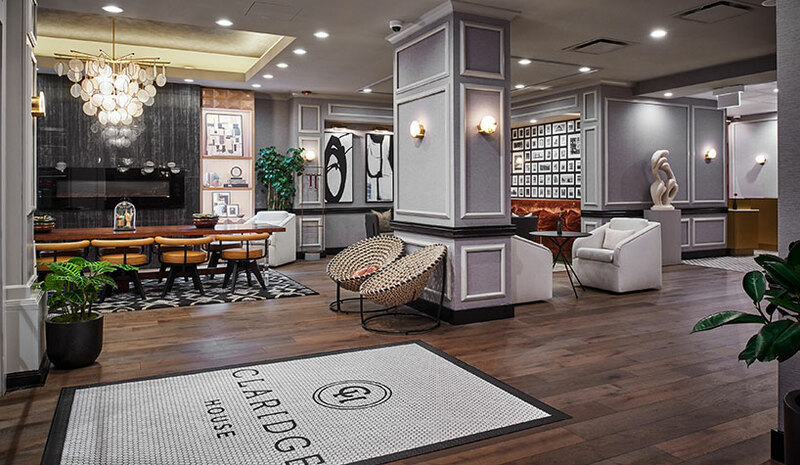 The current owners, Interwest Capital, purchased the property in 2016 and set forth with plans to update and rebrand the hotel, which has now assumed its original name of Claridge House Hotel. Hirsch Associates served as the project architect and The Gettys Group served as the interior designer for the Claridge House Hotel renovation. Cooper Riley provided owner representative services. Oxford Capital Group is the hotel operator. The Embassy Suites by Hilton Atlanta Alpharetta, owned and managed by WCG Hotels, also known as Windsor Capital Group Inc., has renovated the property. The multimillion-dollar renovation began in February 2017. The guest suites, lobby, atrium, restaurant/bar, indoor pool, fitness center and meeting spaces were completely transformed. The 150-room, all-suite hotel is located in Alpharetta’s Northpoint District close to downtown Atlanta. The hotel has 2,400 sq. ft. of flexible meeting space spread among four different meeting rooms. Le Méridien Ra Beach Hotel & Spa in Barcelona, Spain, has updated its guestrooms, meeting spaces, gym and beach club. Led by designer Julie Frank of JCF Studio, the redesign was inspired by the brand’s European heritage and mid-century modern design. The hotel’s 144 guestrooms have been remodeled with new tones and local artwork. Le Méridien Ra has also transformed its beach club with a new food and beverage offering. In addition, the hotel has added a new restaurant. Claridge House Hotel Cooper Riley Hirsch Associates Hotel Indigo Chicago Downtown InterContinental Hotels Interwest Capital JCF Studio Julie Frank Le Méridien Ra Beach Hotel & Sp Oxford Capital Group Summit Design + Build LLC The Embassy Suites by Hilton Atlanta Alpharetta The Gettys Group WCG Hotels Windsor Capital Group Inc.